Kenya Connect’s Learning Resource Center (LRC) has become the hub of enrichment activity in Wamunyu for the students and teachers at 44 primary and 11 secondary schools and has provided material and enrichment resources for the community and beyond. During this past year, most of the primary schools in Kenya received computer tablets from the Kenyan government. Although this was a positive step for rural schools that lack even the most basic school supplies, it was implemented with mixed results since most of the teachers were not comfortable or trained on how to use the technology. When visiting the schools, the Kenya Connect team saw tablets locked in cabinets. When inquiring about the tablets, many of the teachers reluctantly replied they were not comfortable using the technology. As a result, the Kenya Connect staff researched and found a master teacher on the tablets technology. The master teacher has worked hand in hand with our technology specialist Patrick Munguti to develop a three-days training session to help teachers in Wamunyu to effectively use the tablets.. Kenya Connect has also reached out to partner teachers in six other primary schools in Kyaithani Cluster in Kitui county to offer joint training on the new technology along with KC teachers. The master teacher and Patrick will jointly conduct 6 training sessions. 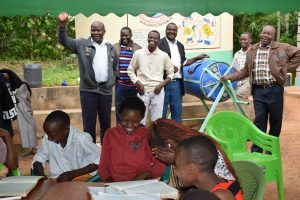 Kenya Connect has been partnering with Kyaithani as a result of our partnership with the Sunshine coast-Sechelt Rotary Club of British Columbia Canada. We are very pleased to announce that the Sunshine Coast-Sechelt Rotary Club’s grant proposal was funded by The Rotary Foundation for $14,800 to provide training for 216 teachers from both Wamunyu and Kyaithani cluster on how to effectively use the technology as well as to provide Rachael plus devices and additional educational content to 6 primary schools. The grant will also fund two projectors in two secondary schools. This dynamic training will begin in January and continue through June, 2018. One of the goals of the training is to have at least 4 teachers from each school successfully learn how to use the technology in order to share it with other teachers in their community. 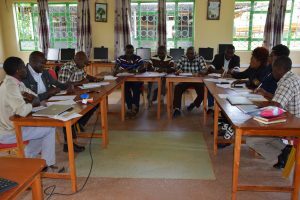 As we prepare for 2018, Kenya Connect continues to look at creative and innovative ways to be a RESOURCE for teachers and students in rural Kenya. Launching our teacher tablet training will be an exciting way to commence the new academic year.